So, today is our last full day, and I really wanted to try the breakfast at Saana that we missed yesterday, so I made everyone get up and dressed by 9:30 so we could get down to breakfast before it closed. It was worth making the effort, as it was really good. This is a full service restaurant at night but as there is no quick service at Kidani, they do a quick service breakfast in the restaurant. It’s nicer than a quick service, you order at a till but they bring the food out to you on proper plates, and you sit in the restaurant with a view of the animals. 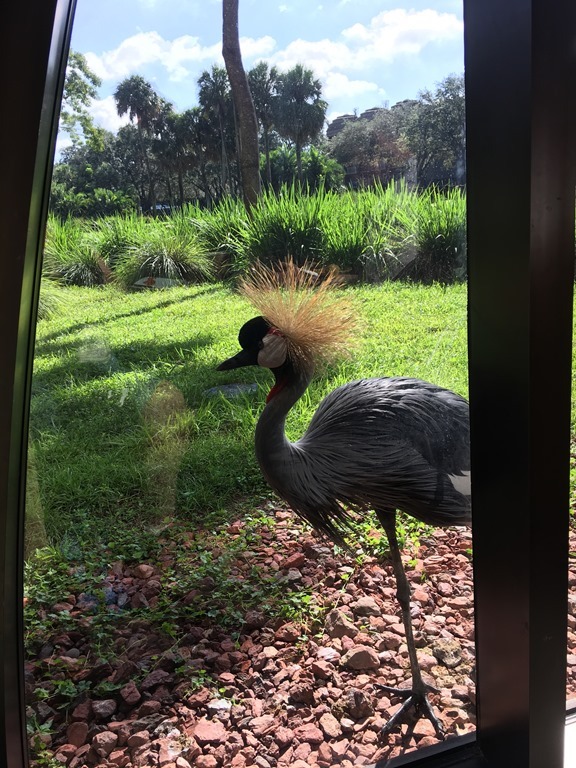 We had a little bird (a crane I think) who kept visiting us at our window. He obviously wanted some breakfast. I think he was admiring himself in the reflection. We enjoyed our breakfast, and then walked out onto the viewing area to take a look at the animals. 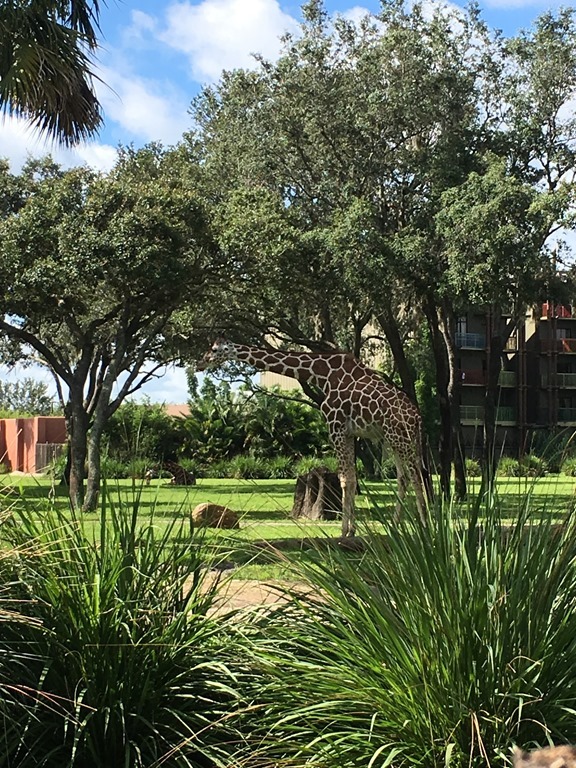 I don’t think Kidani is as impressive as Jambo House (the main Animal Kingdom Lodge building) but I liked the viewing area, it seemed like you could get closer to the animals. 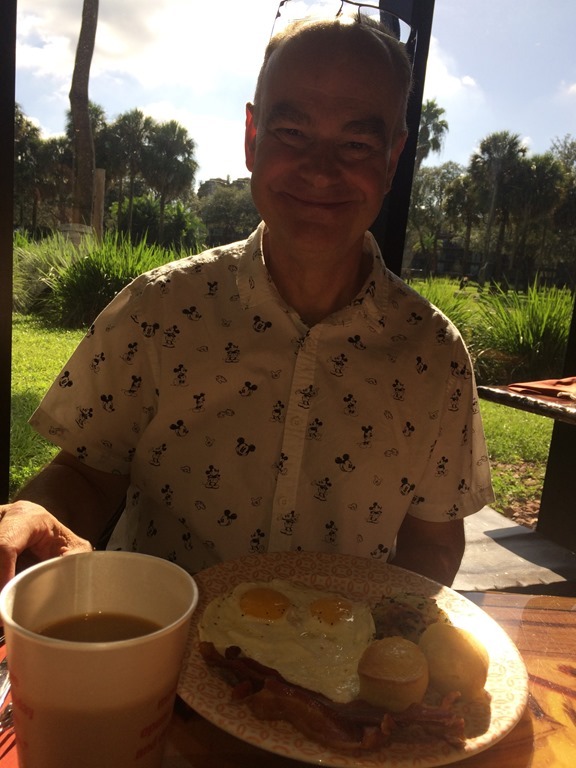 After our breakfast, we caught the bus to Disney Springs. 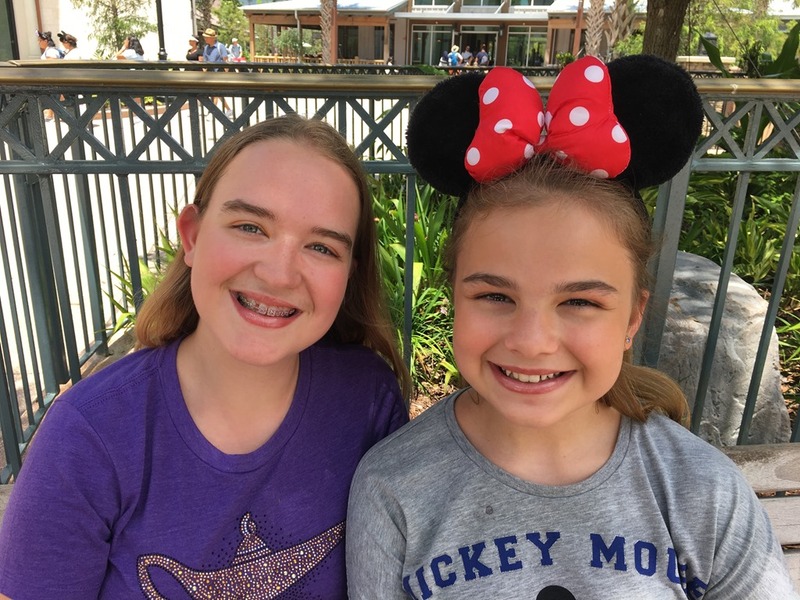 We just wanted a relaxing sort of a last day as it’s been pretty hectic, and the girls still had some spending money to spend. The bus from Kidani took exactly 20 minutes which probably isn’t too bad if you have a seat, but we seem to have been standing for every journey to and from Kidani and this was no exception. You get dropped off right in the middle of Disney Springs by all the new shops. We had a wander around and looked , and I saw the large Coca Cola shop, we we wandered in here and took a look around. I drink a lot of Coke but I don’t really need clothing or gadgets with the logo on. I wanted to go up to the roof and see the view from the bar though. Up there, we saw they did these drink samplers, you could either get 16 drinks from around the World, or 8 ‘float’ drinks. 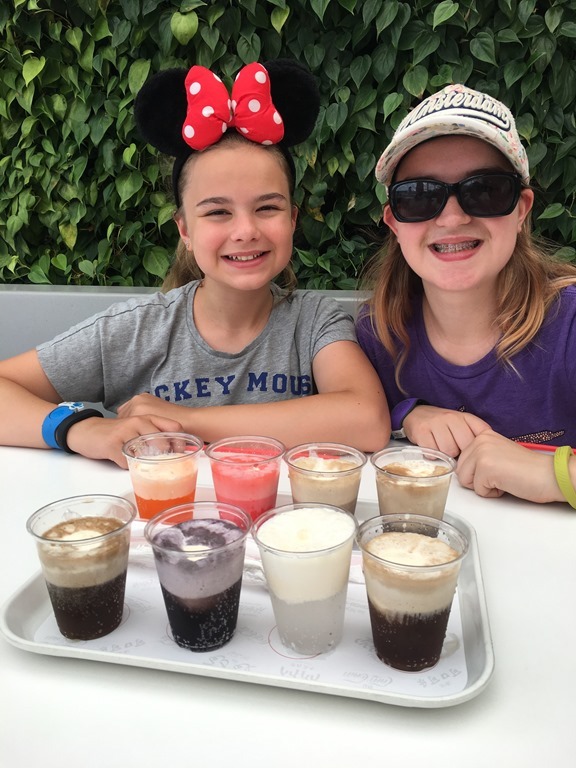 I asked the waitress and she said some of the around the World drinks were ‘interesting’, and it included Beverley which we know we don’t like, so we decided to try the floats, which are all typical american drinks, but still unusual to us. 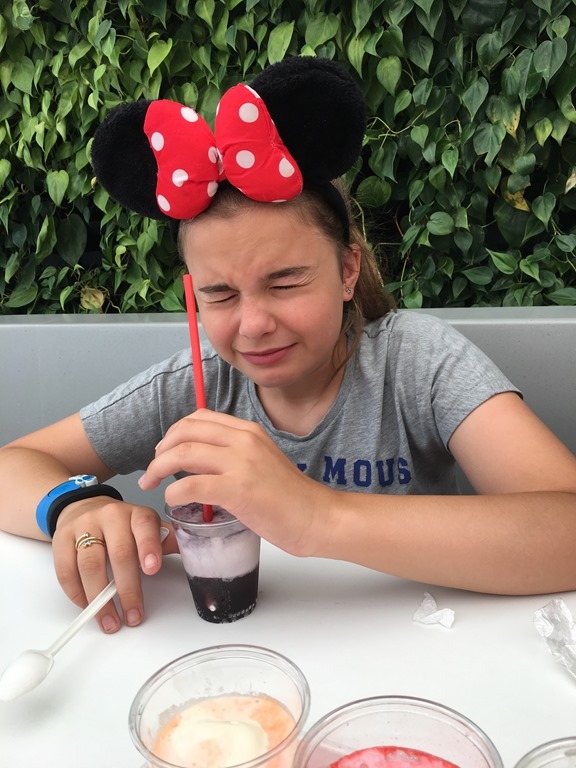 We liked some of them, but definitely weren’t keen on Root Beer or Pibb, and Molly really didn’t like Grape Soda! After our drinks, we walked back through the shops. Molly wanted to look in Mac, so we popped in there and she saw a palette she wanted to buy. 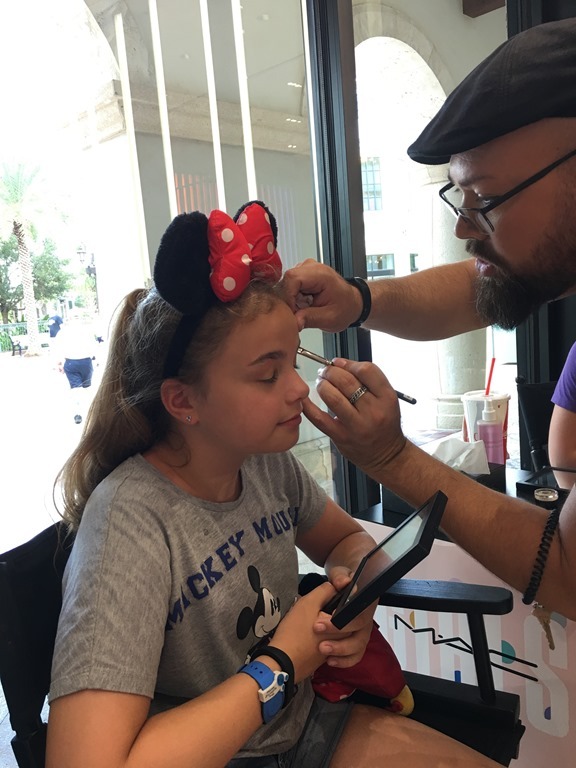 The sales person offered to do her a makeover demonstration with it so she would know how to use it. 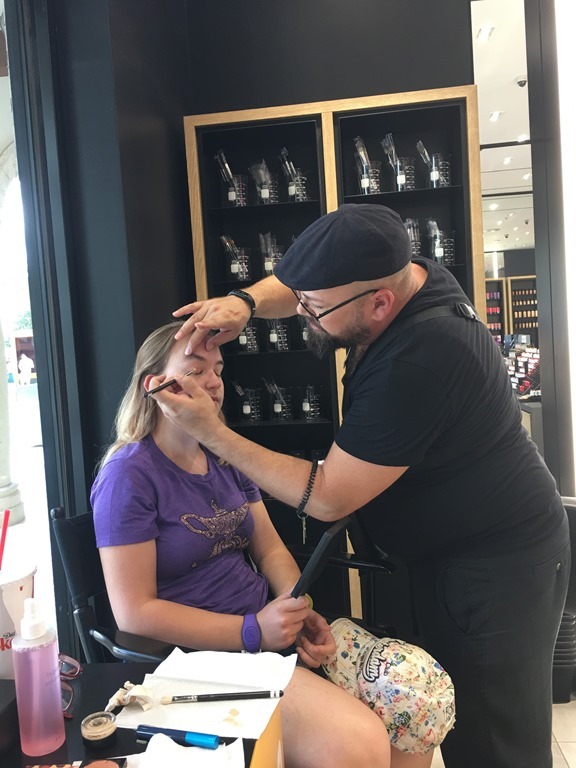 He was really good, telling her to use tornadoes and wind-screen wiper motions when doing her eyes, and he didn’t try and sell her any more products which I appreciated. After Molly’s makeover, Katie had one as well. They both looked lovely when he was finished. After our trip to Mac, we took a look in Uniqlo which is a massive shop that sells lots of clothes including a large Disney section. There Disney stuff is much much cheaper than the Disney store, so worth a look. 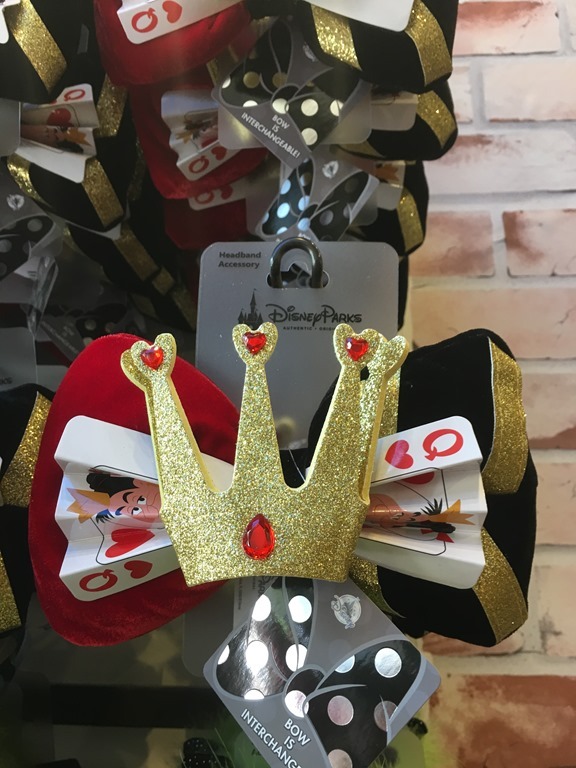 We came out of Uniqlo and took a bathroom break, while we were waiting a castmember told Katie to look in D-Living at the new ears they were doing with interchangable bows. We walked over and took a look but we thought they were a bit pricey. 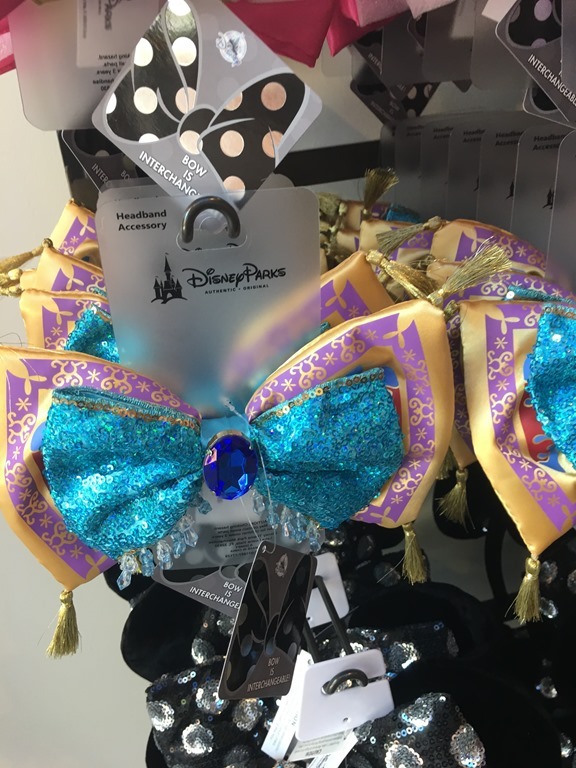 It’s $30 for the ‘starter set’ and then $15 for each new bow. We kept walking around the shops, through the Disney Store (air conditioning! ), I had a look in Basin, and we admired the swarovski and then we ended up at D-Tech, where Molly chose a phone case for her birthday and Katie bought herself one. 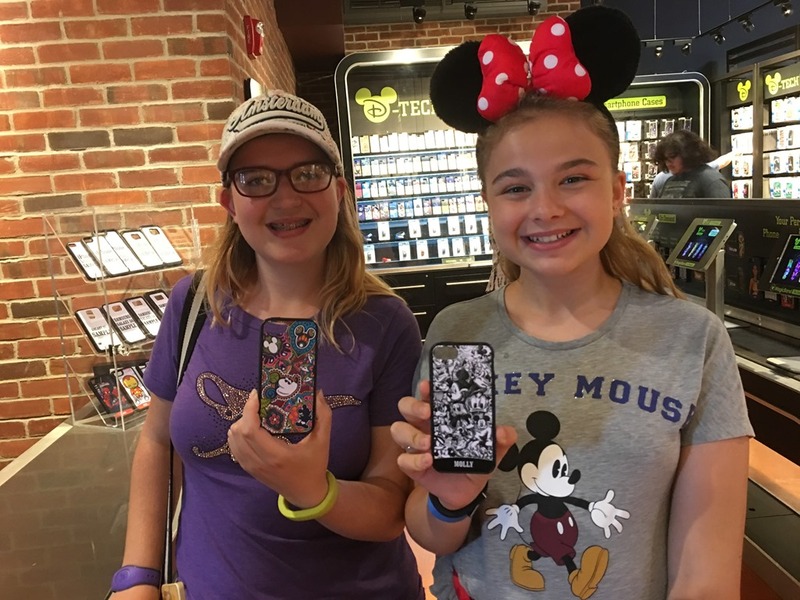 They have both got iPhone 5s, and none of the stores were stocking phone cases for iPhone 5s, but you can have one printed in D-Tech. They aren’t cheap, but I know Molly really wanted one as we have looked for a phone case in every store both this year and last year in Paris. We had to wait 20 minutes for them to be printed, so it was time for lunch. I had been wanting to eat at Wolfgang Puck Express all week ,and had an voucher, so that’s where we went. I noticed in the queue that the voucher had actually expired, but luckily the cast member agreed to honor it anyway. We had a pizza and a cobb salad to share. Our Cobb Salad was delicious and the girls seemed happy with their pizza. After our lunch we went back to collect the phone cases and walked back to the bus stop. This place is amazing. It was so hard to choose. I was particularly impressed with the way they taped each base down so they didn&apos;t move at all and were still perfect back in the hotel room. 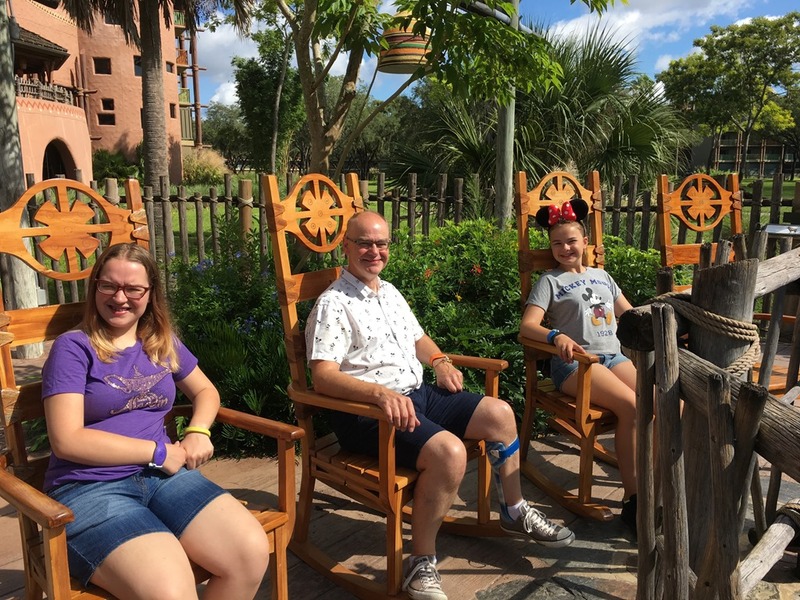 We caught the bus (does Animal Kingdom lodge always have the furthest bus stop) and we were excited to get a seat! Back in the room we enjoyed our cakes and then turned our attention to packing. :(.